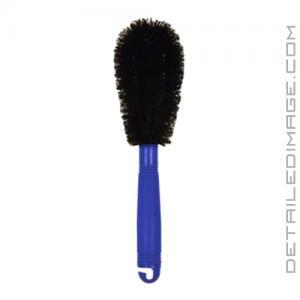 The DI Brushes Spoke Wheel Brush well help you clean spoke wheels with ease! Anyone with spoke wheels knows how hard it is to get into every nook and cranny when cleaning. Some brushes do the job pretty well, but many of them simply just miss various areas. The Spoke Wheel Brush will help you reach all of these tight, hard to reach areas safely and easily! The durable polypropylene bristles measure .50" long and are twisted around a flexible wire. This allows the brush to bend and conform to various shapes, targeting dirt and grime in tight areas, safely and easily removing it from your spokes. The 10.5" handle gives you plenty of area to grip the brush and maneuver it across the wheel. While this brush stands out when being used with spoke wheels, it will work great with various wheel cleaners and other wheels designs as well. Don't let your spokes go without the proper cleaning, use the DI Brushes Spoke Wheel Brush and make your spokes shine!